Our lives have been a bit of whirlwind the past few weeks as we’ve been doing the thing we most love about being an ex-pat in Guangzhou- TRAVEL! We were gone the last two weekends. First, we were in Hainan for Thanksgiving and our first wedding anniversary. Then we flew over to Siem Reap ostensibly so Amaury could compete in the Bike4Kids cycling race, but also so that I could wander around beautiful, ancient temples and palaces and commune with nature (get covered in spiders). Hainan is an island immediately south of Mainland China, which is known as China’s Hawaii. We happened to head down there just as the temperatures in Guangzhou lowered into the 50’s and 60’s, so prolonged our long summer. We stayed in Sanya, a town in the southern part of the island. 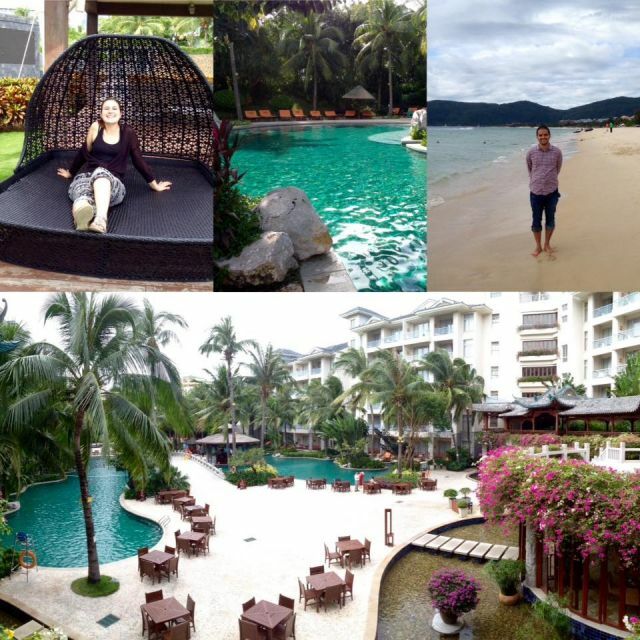 During our three day stay, we spent our time moving between pool and beach, exploring by bicycle, and eating at the big hotels. It was just the relaxing trip we needed, though a bit offset by early morning travel. Although it was a nice getaway from the busy bustle of Guangzhou, we were definitely still in China and being able to speak some Chinese helped us many times in getting around. It turns out that Hainan is also a major holiday destination for Russian tourists. This has increased in recent years due to unrest in Egypt and Turkey, where Russians usually also like to go. China usually has very strict visa requirements, but completely relaxes that for Russians coming to Hainan who don’t need a visa at all. During our entire time in Sanya, we only saw Chinese and Russian tourists. If you’re in Asia and want a taste of China along with a tropical vacation, I thoroughly recommend Sanya. The water was warm and clear, the beaches clean and well cared-for, the resorts were beautiful, spacious, and affordable. 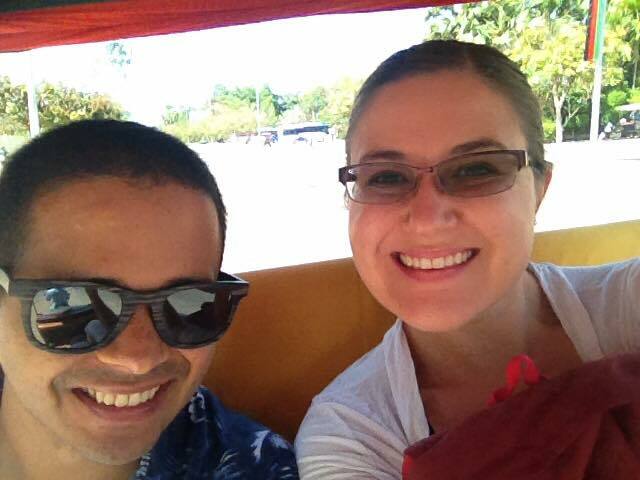 This past weekend we were in Siem Reap, which was very much a break from China. We both absolutely love being in Southeast Asia most of all because of the kindness and hospitality of the people there. And of course, there’s the delicious food. I’d never tried Cambodian food before, but it’s quite similar to Thai food… perhaps with more fish and fried food though? Everything we ate was fresh and light and delicious… except for the friend wontons we had, those were just delicious. We arrived around mid-day on Friday, so, after picking up Amaury’s race materials, spent a blissful afternoon exploring Angkor Wat. 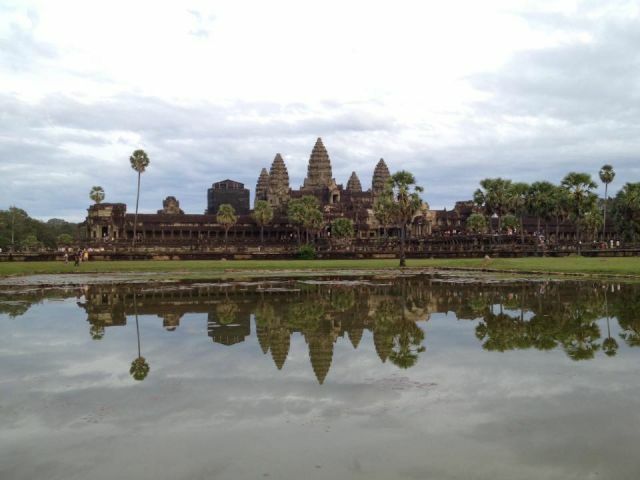 Originally built in the 12th century, Angkor Wat is one of the wonders of the world. In the words of my beloved Lonely Planet guidebook, “it defies superlatives.” It had been high on my list of wonders to see and it surpassed every expectation. 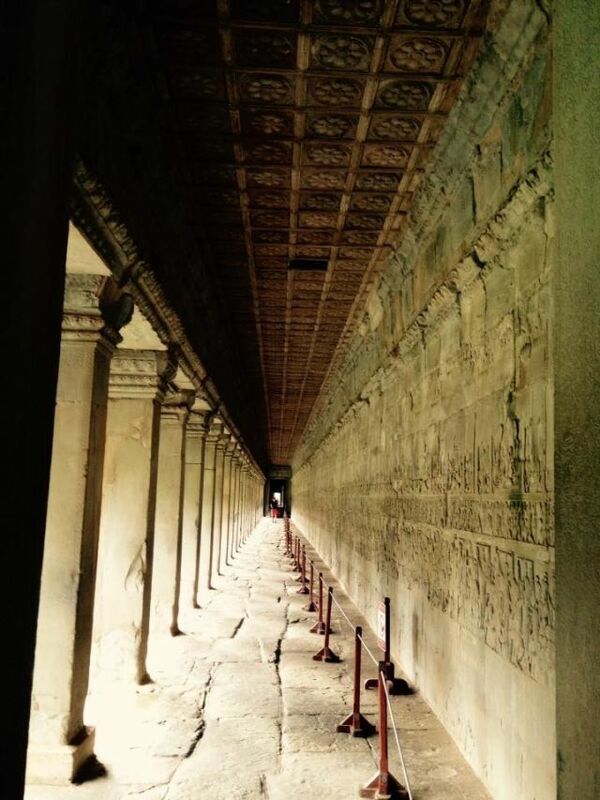 What stunned me the most was how well it is still preserved after being largely abandoned in the jungle for centuries. It’s a testament to what happens when people leave nature to itself. I’m blessed to have seen the ruins in Athens and Rome, but in Angkor Wat you start to feel like the structures can’t even be termed ruins… I could squint and almost see what it was like hundreds of years ago. Absolutely stunning. The next day we got up before the dawn to head to Amaury’s race. 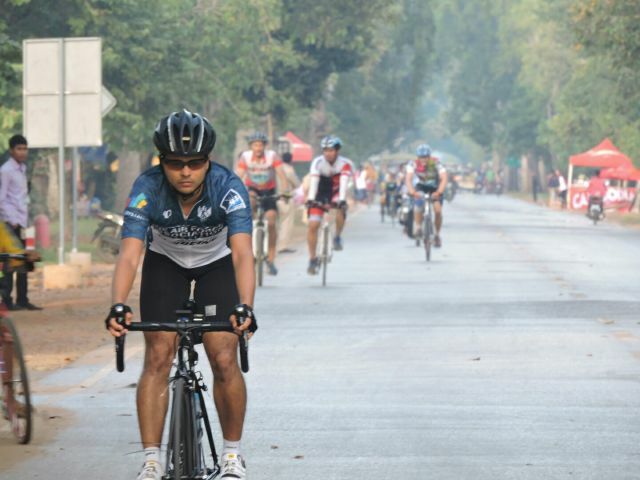 While he cycled, I spent a peaceful morning wandering around the ancient city of Angkor Thom. Here the structures were more ruins than buildings, but many areas were still impressively preserved. 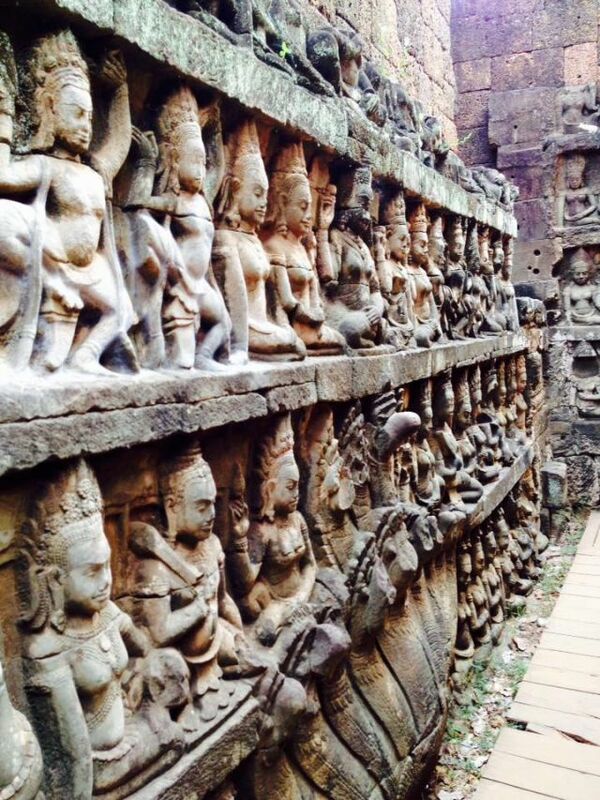 My favorite part was finding a hidden wall where carvings of apsaras (per Wikipedia: a female spirit of the clouds and waters in Hindu and Buddhist mythology) were particularly clear. My second favorite part was coming upon an old palace that was deserted of tourists since it was still very early in the morning. I put aside my fear of heights and climbed to the top where I shared a beautiful view with some very large spiders. After Amaury’s race (he did 100km in 4 hours! ), we had a restful afternoon at our hotel and then went to the art night market in Siem Reap. 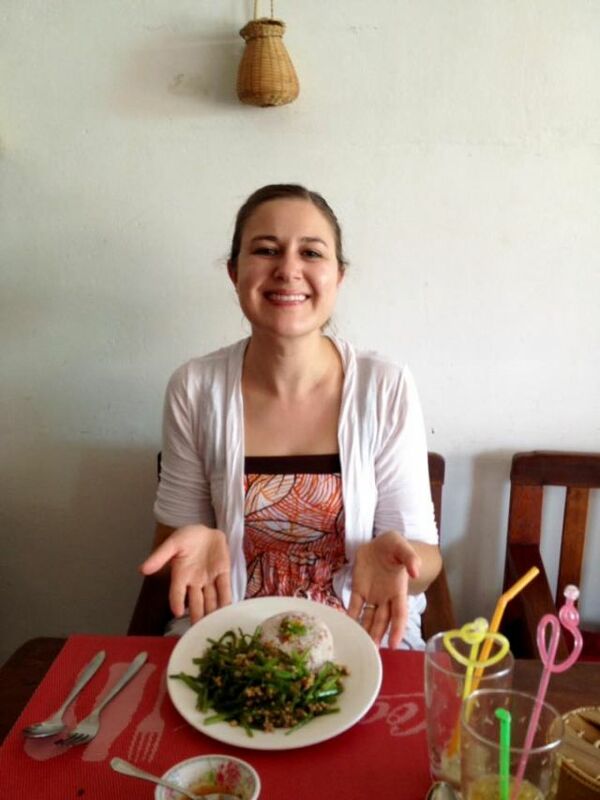 Our flight didn’t leave until the evening the following day, so we had time to enjoy a leisurely brunch at a tasty vegetarian-friendly restaurant before exploring Ta Prohm. This temple is also known as the “tree temple” because the jungle has taken over much of it with trees growing on and through the buildings. 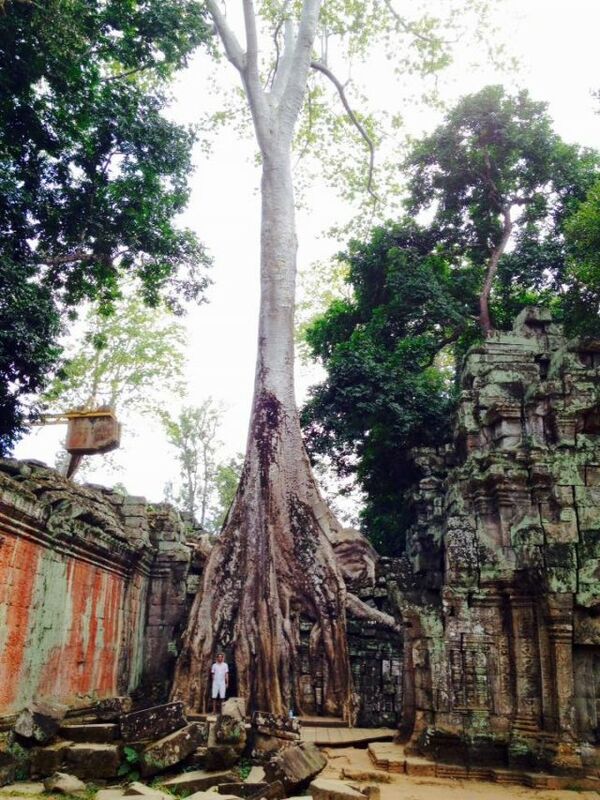 Ta Prohm is also famous for featuring in Tomb Raider. We returned dusty but happy to the hotel where we had time to spend a luxurious hour by the pool, piña coladas in hand before heading to the airport. Both of these trips rank high on my mental list of best trips ever, though they also completely wiped us out. In a 10 day period, we got up before 4am four times. While I enjoyed a certain self-satisfaction when getting up before dawn, we actually started to experience a weird jet-lag. I think our travel-worn bodies assumed we must be adjusting to a new, horrible timezone. Meanwhile, during the shortened work weeks Amaury had a full plate with the launch of a new initiative he’s been working on as well as his training regimen for the race. I’ve also found myself with a full schedule lately. I’ve been putting in a lot of hours at my freelance research gig and was recently promoted to review other researchers’ work. It feels good to have expanded that to a viable part-time job, but of course, it takes time. And the holiday season is now upon us! My calendar is full of choir rehearsals and performances where I get to sing a range of holiday tunes- my favorite on the international choir’s program is “O Holy Night” which is full of the most beautiful harmonies… though it apparently requires not breathing during the whole thing. Our choir director has become increasingly stern with us, frowning that we are not happy enough when we sing and firmly telling us to stop hiding behind our music. Tonight we’re performing at a Westin hotel where the ladies get to wear long, flowy ball gowns. It’s all very exciting and a great way to get into the holiday spirit. Before we left the States, many people recommended bringing our own holiday decorations including an artificial tree. Christmas is my favorite day of the whole year; I love the anticipation of it, the colors and lights, the carols, the expressions of love and kindness, and the day itself of opening presents, eating good food, and doing nothing but enjoying that it’s Christmas. I’ve lived a very charmed and privileged life when it comes to Christmas mainly thanks to my wonderful parents who always made it a special day. Indeed, I believed in Santa Claus quite late due to my parents’ sneaky ways of keeping the dream alive- IE my dad going outside and ringing jingle bells under the window so I would think Father Christmas was flying along in his sleigh. As an adult, I relish bringing that charm to Christmas day for myself and others. This year, Amaury and I will be cozying up in our little home and spending our first Christmas together. I prepared to make our own Christmas magic, just like many of our friends around the world have to do in places where Christmas is not celebrated. It turns out, though, that China is actually an excellent post for celebrating Christmas as a foreigner. Most of the population do not celebrate Christmas, at least not in a religious sense, and those who do have to be cautious due to heavy government control over churches. I haven’t had much direct exposure to those religious limitations, though I did learn recently that only foreigners are allowed to attend the non-state-controlled Christian churches in Guangzhou. Our holiday choir performances are primarily for foreigners. 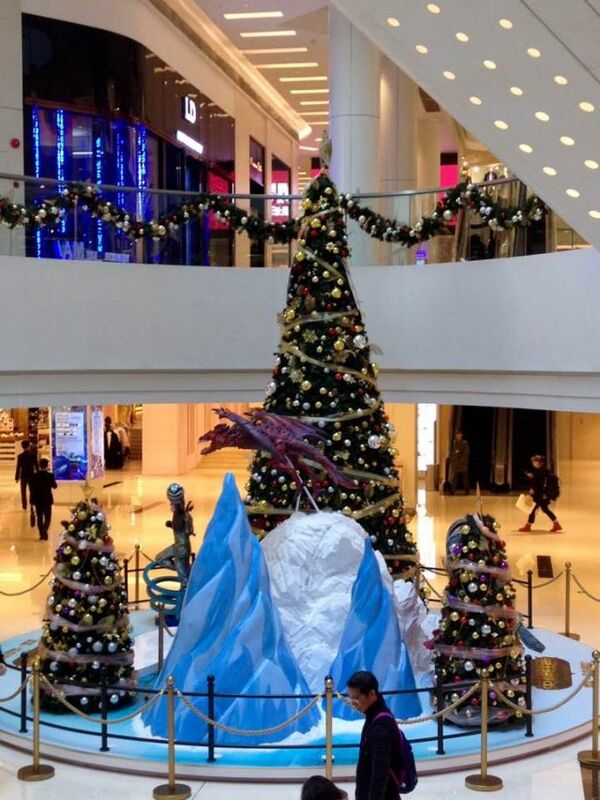 All that said, Chinese people in Guangzhou love the commercialized aspects of Christmas. There are (artificial) Christmas trees EVERYWHERE, tinkly Christmas carols are playing in shops, and many coffee shops are offering Christmas fare. I even found a Gingerbread latte (my favorite!) 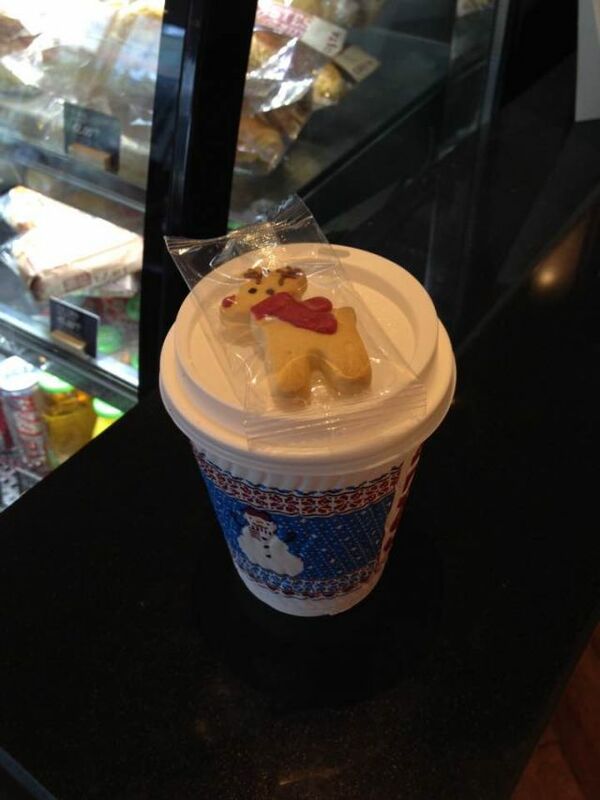 in Costa coffee that came with a reindeer cookie. Yet, there are little signs that Christmas-business is not as usual here. Stores aren’t emphasizing any Christmas sales or deals for gift-giving and many of the holiday displays have strange touches. For example, this is the first time I’ve seen a dragon flying in a Christmas display. I really enjoyed that my local grocery store was playing carols in Cantonese yesterday though, which felt a little more authentically Christmas-related. So after a lot of travel, we’re planning to settle down a bit at home for the next few months to enjoy Guangzhou and replenish our bank account. I’m crossing my fingers and toes to have more work in the New Year so we can save up more funds for our trip to the U.S. in April. I hope you’re enjoying December and the holiday season wherever you are.